A few years ago, we went through a wonton phase. We were eating wontons for lunch or as an at-home date night treat at least once a week. It was a little crazy. Most of the time we had cream cheese wontons. Every once in a while, we’d mix things up a bit with the fillings. One of the biggest hits we stumbled on was definitely a pleasant surprise – the PB & J wonton. It was born of necessity based on an empty pantry in need of a trip to the grocery store. We needed lunch and we had wonton wrappers, peanut butter, jelly and oil but not much else. So I figured it was worth a shot. Everyone loved the way the wontons turned out. 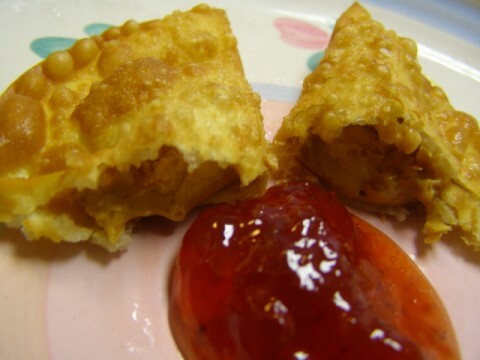 The peanut butter gets nice and melty and the crisp wonton shell works perfectly when dipped in the jelly. More a method than a recipe, but definitely worth sharing! 1. Place a dollop of peanut butter in the center of a wonton wrapper. Wet edges with water, fold over and press together. Repeat until done. 2. Pour a few inches of oil into a skillet and heat over medium high heat. Add a few wontons to the oil at a time, being careful not to overcrowd the pan. Cook until golden brown, about 1-2 minutes per side. Drain on paper towels or brown paper bags. 3. Serve wontons with jelly and/or jam of choice for dipping. These peanut butter filled wontons also double as a great dessert when drizzled with melted chocolate or simply sprinkled with some powdered sugar. I would have never thought to make a PB & J Wonton, but it sure looks good! I will have to give them a try. Thanks for the fun post! These look incredible. I would never have thought to use wonton skins in this way to make such a sweet dessert. By the way, I just made your Apple Jacks Cereal cookies and really liked them. I’ve posted them on my blog – http://sweet-as-sugar-cookies.blogspot.com/2010/10/12-weeks-of-christmas-cookies-apple.html. We used to make grilled peanut butter and jelly–butter two slices of bread, put pb&j in the middle, and grill like you would for grilled cheese. These sound similar and very yummy!